Analyzing how three maps of Barbados promoted a flattering image of British colonialism in the Caribbean. To any nation pursuing the creation of a New World empire during the early modern period, maps indisputably held great importance. Together with other products of the geographic trade, they provided a fundamental means to construct and disseminate among a curious public an image of power, ownership and authority abroad. As Harley and Woodward suggest in their seminal History of Cartography, mapmaking ‘was one of the specialized intellectual weapons by which power could be gained, administered, given legitimacy, and codified’. Maps produced by those with personal experiences of imperial provinces often afford a telling indication of how inhabitants saw newly colonised lands, or indeed how they wanted the British public to perceive those places. 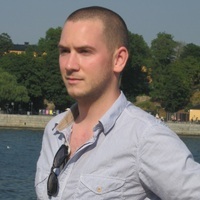 In the case of the 17th and 18th century British Caribbean, such documents can demonstrate how landscapes were physically and conceptually shaped over time to support an emerging plantation economy. It is all too easy for us to think of these kinds of historical sources today as objective visual records – as precise spatial representations that can be relied upon for truth and accuracy. This, however, is not necessarily the case. Such assumptions are very much tied to our modern conception of cartography as a highly regulated practice overseen by a range of professional bodies. When looking at maps like those discussed in this article there are many factors we need to consider. Who collected the information? Who decided what to include or leave out? Who was the document originally intended for? These questions, and others, should be at the forefront of our minds. When Richard Ligon produced a map of Barbados with an accompanying description of the island in 1657, the notion of ‘truth’ was certainly one that he was keen to promote. The work’s title, A True and Exact Historie of the Island of Barbadoes, makes this quite clear. Combining travel narrative and personal diary with natural history, civil history and imperial promotion, the publication can be understood as belonging to a hybrid colonial literary genre that was particularly popular at the time. The map that Ligon used to preface his text is believed to have been based on a draught made by John Swan, the island’s leading surveyor. Using information gathered by Swan, it indicates ‘tenn Thousande Acres of Lande which Belongeth to the Merchants of London’, and lists the names of landowners along the coastline. In doing so, it suggests the emergence of an organised plantation economy. Yet, there are no signs of crop-growing among the many features illustrated. The regimented monoculture created by Barbados’ booming sugar cane industry, which had dramatic implications for the look of the landscape, is nowhere to be seen. Given that Britain was importing about 5,000 tonnes of Barbadian sugar annually by the 1750s, this seems somewhat surprising. Instead, the majority of the map’s imagery evokes a sense of untethered variety, action and liveliness. The interior is decorated with a series of dramatic friezes. These relate to personal anecdotes retold in Ligon’s accompanying text, which date from the time he spent in Barbados between 1647 and 1650, when he most likely worked as a plantation supervisor or manager. The illustrations concern day-to day encounters, including interactions with colonists, slaves, and native inhabitants. In a detail that seems shocking to our eyes today, escaped slaves are dramatically pursued and shot at by a white man on horseback. Elsewhere, a stylised figure of a native ‘Indian’ is labelled as ‘Salymingoe’ with ‘his Canowe 35 foot longe’. In another part of the map there is a pair of camels, and a little further away there are two men on horseback, wearing armour, who appear like chivalric knights of an almost fictional British realm. There is a distinct sense of fantasy here, which evokes something of the carnivalesque. Ligon’s richly illustrative and highly imaginative way of working reflects the close links between cartography and art that existed during the period. Mapmaking and landscape painting were far less distinguished from one another than they are today; in fact they were understood as very closely related artistic pursuits, often carried out by the same people. Both practices were approached in a highly subjective manner, and each permitted a certain amount of artistic licence in order to convey a coherent sense of narrative. It seems appropriate therefore that in his introduction, Ligon described his work as both ‘a piece of landscape’ and ‘one of story’. A map of Barbados published by John Ogilby in his 1671 atlas of America, exhibits a rather different set of preoccupations and motivations. In contrast to Ligon’s map, Ogilby’s effectively tidies the landscape. The island is dominated by enormous representations of cash crops. These are marked as ‘A Cabage tree’, ‘Indian Corne’, ‘Pappaw tree’, ‘Bennawnol’, ‘A Pine Aple’, and ‘Suger Cane’. In comparison to the slaves depicted by Ligon, who resist enforced labour and risk their lives to gain their freedom, those presented by Ogilby dash back and forth, harvesting the crops and evoking a well-oiled system of industry and productivity. Such illustrations conceal the harsh reality and brutality of slave life as it actually existed. Notably, Ogilby’s map includes a series of lines, representing the 32 directions of a mariner’s compass. These are distinctive features of a portolan chart, and seem to suggest the map’s usefulness as a practical tool. First introduced in the late 13th century, portolan charts marked a significant development in the use of cartography as a navigational device. Based upon direct observation, they were essential for sailors, and provided precise delineations of coastal regions to facilitate the safe passage of ships. Details of landscapes were often eliminated, as these were not typically required by such users. These kinds of charts would have been crucial for British merchant vessels making their way through the shallow waters around Barbados’ ports and inlets in the late 17th century. Despite adopting some of the characteristic features of a portolan chart, Ogilby’s map was not actually used for this purpose. The atlas it was produced for was a distinctly lavish tome, encased in a fine leather binding and printed on gilt-edged paper. It was evidently a publication intended for an aristocratic clientele, and one that was far more likely to be found in the libraries of country houses than on board ships. The portolan schema, it seems, served a solely symbolic function, to emblematise the constant to-ing and fro-ing of ships from the colony. Certainly, many of Ogilby’s affluent readers would have had financial investments in West Indian commerce, and so this diagrammatic visualisation of the island’s thriving economy would have been of great interest. The presence of these details on the map indicate Ogilby’s astute understanding of cartography not simply as a means of representing space, but as a way of advertising the business opportunities presented by colonial development. Ogilby’s map uses Latin text, rather than English. It is also infused with the pictorial language of classical learning: the frolicking putti who surround an ornate cartouche typify this sort of imagery. 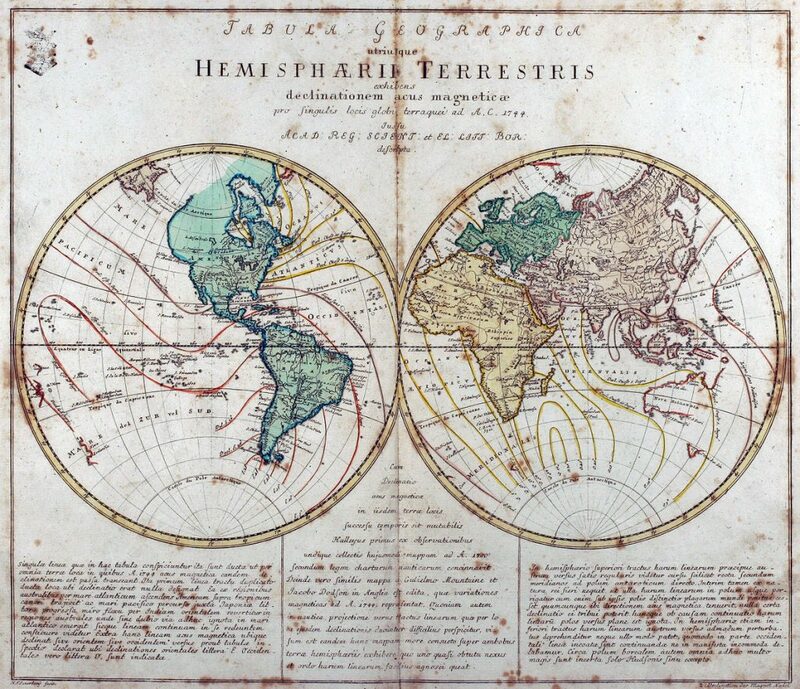 Such features distinguish the map as a scholarly product, suited to a particular kind of erudite and well-educated patron, known at the time as a ‘Virtuoso’. Branding an image of the New World with the established iconography of the Old World was a common technique of cartographic design, which lent an air of gravitas and cultural distinction. 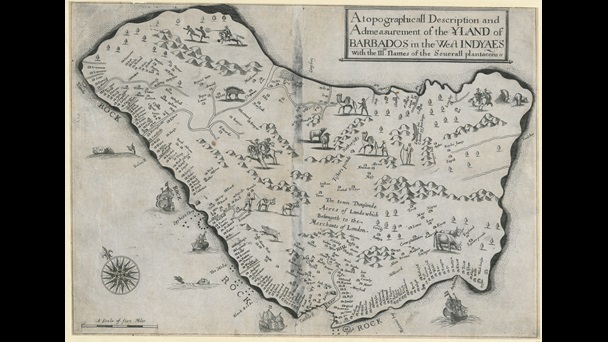 Cultivating a distinctly European image of colonies like Barbados, this calculated use of word and image allowed map producers to allay people’s fears of the unknown, quashing popular notions of the New World as an uncultured or unsanitary place. 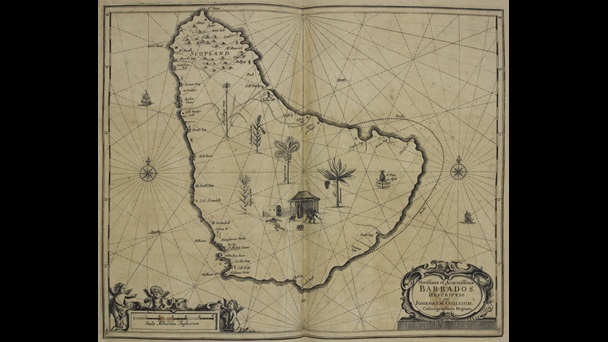 In William Mayo’s 1722 map of Barbados, we see a far greater separation between ‘map’ and ‘landscape’. Here, snapshots of local scenery are removed from the map altogether and inset in adjoining vignettes. In one of these vignettes, a surveyor is shown taking measurements across a hilly landscape. Two slaves assist him: one carries equipment and another operates a distance-measuring wheel. There is an implication of happy compliance rather than enforced labour here. Elsewhere, we are presented with a prospect view of Codrington College. This educational establishment was financed by the bequest of Christopher Codrington, a sugar cane estate owner who died in 1710. It was set up under the auspices of the Society for the Propagation of the Gospel in Foreign Parts, a missionary organisation of the Church of England, and one of the largest slave owners in Barbados at the time. The college provided preparatory education for the children of the local British gentry and expatriate planter classes. 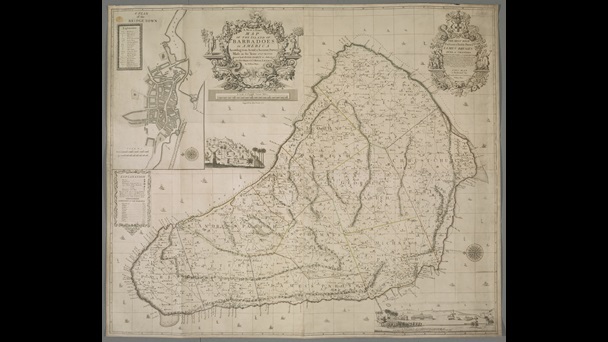 Although building began in 1714, Codrington College did not formally open until 1745, some 20 years after Mayo’s map was first published. In this context then, the prospect view promises an imminent future where not only wealth, but also an education, can be gained in a colonial setting. Together, the two vignettes on Mayo’s map cultivate a vision of Barbados as a self-sufficient society with a well-developed infrastructure, fit for settlement by ‘polite’ and ‘civilised’ people. As we know all too well, this utopian image of the colony, conjured by British mapmakers and publishers throughout the 18th century, belied a society that was anything but civilised. In reality, such pictorial elements of cartography mask a dark and sinister side to life, in which the development of a social, political and physical landscape relied upon the brutal exploitation of thousands of enslaved Africans. J. B. Harley and David Woodward (eds. ), The History of Cartography, vol.I (Chicago and London: University of Chicago Press, 1987), p. 506. ‘The Fair, the Carnivalesque and the Grotesque: Envisioning the Colonial Body’, in Kay Dian Kriz and Geoff Quilley (eds. ), An Economy of Colour: Visual Culture and the Atlantic World (Manchester and New York: Manchester University Press, 2003), p. 5. This entry was posted in Uncategorized and tagged Art History, British, Caribbean, Early Modern, England, History. Bookmark the permalink.